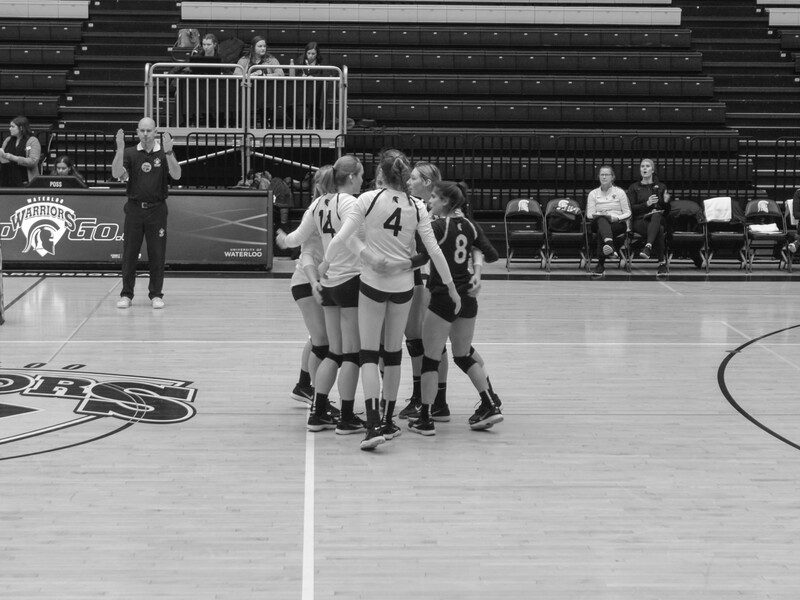 The Warriors’ women’s volleyball team began a five-game homestand on Jan. 18 and 19, with games against the RMC Paladins and the Queen’s Gaels. The Warriors remained undefeated, progressing to an 11-0 record on the season following back-to-back victories. On Jan. 18, the women took care of business in straight sets, defeating the Paladins with scores of 25-20, 25-12, 25-23. Warriors’ coach, Richard Eddy, utilized his full roster in the victory as the team rose to the occasion. Rookie left side Sarah Glynn scored a team-high of 11 points on 10 kills and two blocks, while fourth-year Samantha Warner pitched in with nine points on the night. Setters Katrine Eistrat and Claire Gagne were exceptional as well, combining for 32 assists in the victory. Libero Sarah Remedios continued her strong defensive play from the previous weekend with 11 digs. As a whole, the team totalled 48 digs and 36 kills in the decisive victory. The next night, in front of a large crowd at PAC, the Warriors took on the Queen’s Gaels in what promised to be an entertaining match-up between two strong teams. The Gaels entered ranked third in the OUA East Division with a record of 6-4. The crowd was cheering loudly as the Warriors took the first two sets with scores of 25-22. It looked as if the Warriors were going to pick up back-to-back straight-set victories. However, the Gaels rallied back after going down 8 points in the third set, staying alive with a 25-22 victory. They kept their momentum going and won the fourth set with a one-sided score of 25-13 to force a fifth and decisive set. The Warriors regained their composure and showed the Gaels why they are undefeated, winning the final set comfortably with a score of 15-10. Claire Gagne showed off her stellar passing game with 34 assists (and four kills!). Once again, Libero Sarah Remedios was huge for the team, coming up with 16 digs and some stellar defence when the Warriors needed it most. However, the Warriors player of the game was outside hitter Claire Mackenzie, who put away points throughout the game with thunderous hits. She tallied 18 hits on the night to take her past the career milestone of 800 kills. It was a huge victory for the Warriors, who showed their mental willpower and resilience to close the game. It was the first time the team had ever been forced to a fifth set after going up 2-0. The Warriors are 6 points clear of the rest of their division, which is also the point difference separating places 2-6. The women will be back in action next weekend at PAC, as they look to remain undefeated in games against the York Lions and Nipissing Lakers.